Tooth whitening removes stains from the teeth caused by coffee, teas, tobacco, food and tartar. As we age our teeth naturally darken, aging our smile. Whitening can take years off your smile. 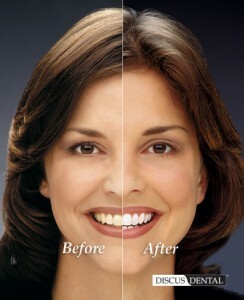 We offer Contrast take home whitening program for our patients. With custom fitted trays you can safely whiten your teeth in seven to ten days. If you are in need of a faster whitening we also offer in office whitening. Within one office visit you can have a brighter, whiter smile. We’ve been using tooth whiteners for years and have never seen any adverse effect on teeth or gum tissue.